Speak to almost any new music blogger and they'll tell you about the dreaded band backlog. 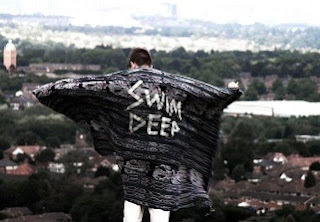 Swim Deep have been just another victim until now. A couple of months after I casually dropped their name, along with fellow Midlands bands Peace and Troumaca, I'm finally on it. Join the trio with their blissed out sounds below. It's hard not to resist all the water-related puns so basically I'm not going to. Sorry guys. Swim Deep have been making waves in the West Midlands for a while now but it's the appearance of their ode to Warpaint bassist Jenny Lee Lindberg, 'King City', that's particularly attracted the attention of the NME and a handful of blogs. Produced by Foals and TEETH collaborator DREAMTRAK, 'King City' carries elements of MGMT while showering itself in carefree dream-pop. But it's the older demos that captured my attention originally - dive into the beach vibes of 'Santa Maria' and 'Isla Vista' below.